NB Comentary: She handed him his arse!! When it comes to Donald Trump supporters, it’s become pretty clear what you’re gonna get. They’re either people too dumb to tie their own shoelaces, or they’re jerks who embrace racism, misogyny, and the need to prove their manhood. 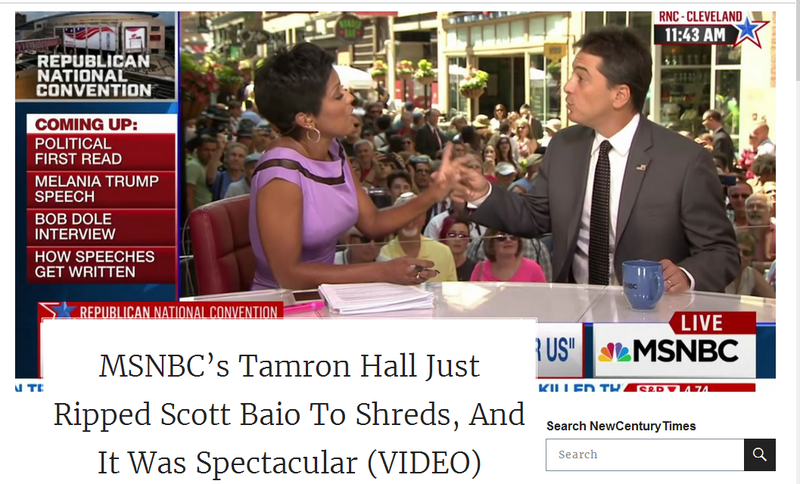 Baio sat down with Tamron Hall on her MSNBC show while at the Republican National Convention. Hall pressured him to answer why he would post a photo on Twitter of Hillary Clinton in front of the word “c*nt” and then continue to call himself a good Christian. The former TV star could quite literally be seen talking out of both sides of his mouth, both defending his use of the image, but also claiming it was all in innocent fun. It was quite the sight to behold. Baio then laughs at her and gives a nod to the all white Trump crowd behind them who was cheering him on as if to say, “can you believe this chick?” You could smell the misogyny through the television screen. This doesn’t stop Hall, though. She kept the pressure on the washed-up television star, and kept pointing out the fact that he’s a hypocrite who claims to have higher moral standing as a supposed Christian, even though he tweets out images of Hillary in front of the word “c*nt” and disparaging photos against First Lady Michelle Obama. Hall also pressures Baio to reveal that if Trump were to shoot someone in the middle of 5th Avenue, as the candidate previously said he could and still win, if he would still support him. A question that he couldn’t answer, but seemed to insinuate he would. All in all, it was a spectacular takedown of the former ‘Happy Days’ star, and she deserves an award for even needing to be in the same airspace as that guy. Sarah is a liberal writer who’s been writing and commenting on politics for over 5 years as the Opinionated Democrat on Facebook. She is also the founder and Editor-in-Chief of the online satirical publication Free Wood Post.